Ever since I posted the article Skin Signs of Thyroid Disease written by dermatologist Dr. Amanda Oakley, I’ve heard from countless Hypothyroid Mom readers struggling with various skin-related issues. There are two that come up often – acne and melasma. I decided to dig into the research to see why so many of my readers are having these issues. Hyperpigmentation in thyroid disorders has been reported mainly in hyperthyroidism. Interestingly, we found pigmentary disorders – diffuse hyperpigmentation, melasma, and periocular pigmentation to be a very unusual common complaint in a total of 12 patients (37.5%). The explanation of hyperpigmentation in hyperthyroid patients is increased release of pituitary adrenocorticotropic hormone compensating for accelerated cortical degradation. 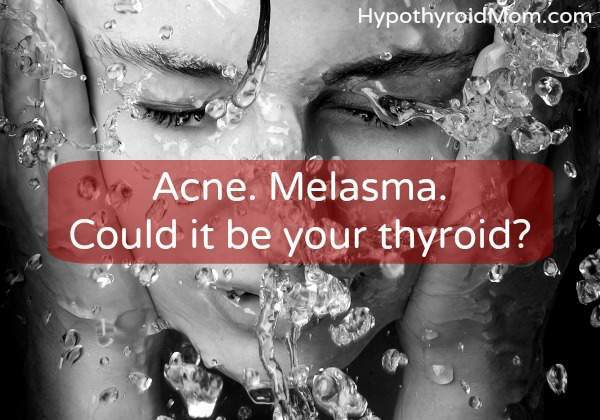 In hypothyroidism though, the cause of melasma cannot be explained although it has been documented in literature. The Journal of Dental and Medical Sciences published the article Skin Manifestations of Hypothyroidism – A Clinical Study. Thyroid disorders are known to cause a wide range of skin manifestations. Hypothyroidism causes changes in the skin, hair and nails. The aim of our study was to evaluate the skin manifestations in patients with hypothyroidism. A total of 100 patients with hypothyroidism attending the General Medicine and Dermatology of Dr. Pinnamaneni Siddhartha Institute of Medical Sciences over a period of one year were included in our study, and the skin lesions have been recorded after a detailed history and clinical examination. Out of 100 patients, 63 patients had skin manifestations. Xerosis (acquired ichthyosis) (abnormally dry skin) and diffuse hair loss were the common skin manifestations which were seen in 38.09% and 34.8% of patients respectively. Melasma(14.28%), chronic urticaria(14.28%) and generalised pruritus(11.1%) were the other common manifestations. Tinea corporis, vitiligo, alopecia areata, lichen planus and xanthelasma palpebrarum were the other skin disorders associated with hypothyroidism.We therefore conclude that a better understanding of the skin lesions helps in the early detection of the underlying hypothyroid state. Melasma is a relatively common skin disorder that primarily affects areas exposed to sunlight. The cause of melasma is not well understood yet. In this study, it was found that abnormal levels of TSH are associated with a higher risk of developing melasma. Also, it was found that serum levels of TSH, anti TPO and anti-thyroglobulin are higher in patients with melasma. 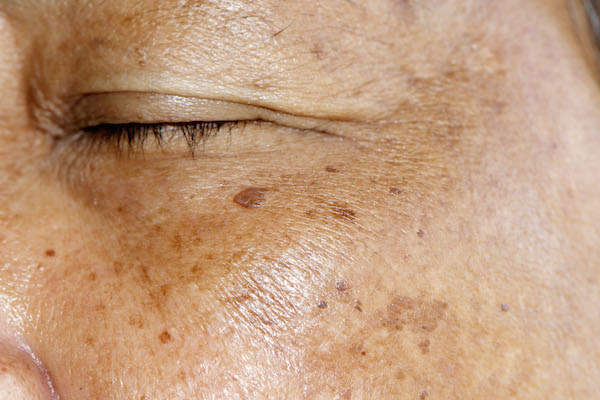 Melasma is one of the most frequently acquired hyperpigmentation disorders clinically characterized by symmetrical brown patches on sun-exposed areas. To date, few studies have been conducted about the relationship between thyroid autoimmunity and melasma. To evaluate the thyroid dysfunction and autoimmunity in nonpregnant women with melasma. A total of 70 women with melasma and 70 age-matched healthy women with no history of melasma were enrolled in the study. We studied the thyroid hormone profile in both groups. Patients with melasma had 18.5% frequency of thyroid disorders, and 15.7% had positive anti-TPO, while subjects from the control group had a 4.3% frequency of thyroid abnormalities, and only 5.7% had positive anti-TPO. There was a significantly higher prevalence of thyroid dysfunction in women with melasma compared with control group. This study suggests that there is a relationship between thyroid autoimmunity and melasma. Adult women with acne had a statistically significant increased relative risk to have high levels of anti-TG in comparison with healthy controls. This association was independent of age. Values for TSH, FT4, FT3, T4 and anti-TPO did not significantly differ between the two groups. No significant difference was found regarding the thyroid ultrasound findings. Although there was no significant difference between cases and controls regarding CRP levels, it is interesting that we observed a significant elevation in CRP (C-Reactive Protein) in those acne patients who had positive antithyroglobulin antibodies. Often times thyroid antibodies for Hashimoto’s, the leading cause of hypothyroidism, are not run on hypothyroid patients. This really blows my mind and I urge every hypothyroid person to push for thyroid antibody testing. There are two thyroid antibodies to test for Hashimoto’s – Thyroid Peroxidase Antibodies and Thyroglobulin Antibodies (also called antithyroglobulin antibodies). Please note that often time when patients push for Hashimoto’s testing, only Thyroid Peroxidase Antibodies are tested. Yes TPOAb antibodies are most common in Hashimoto’s, but it’s important to also have your Thyroglobulin Antibodies. You can see from the above study that this is particularly important if you have acne. This study also brings up the important lab test known as C-Reactice Protein (CRP) which is a measure of inflammation and said to be the best new test to predict heart disease. 220 patients with thyroid disease and 90 healthy individuals as a control group attended a study to compare skin findings of patients with thyroid diseases. Among 220 cases, in 125 skin findings were detected. The most frequently observed skin findings were chronic urticaria (6.8%), vitiligo (6.8%), diffuse alopecia (6%), acne vulgaris (5%) and acne rosacea (3.6%). Several times I have heard from Hypothyroid Mom readers struggling with acne who also describe symptoms that jump out at me as possible symptoms of polycystic ovarian syndrome (PCOS) including anvolution (no ovulation) or irregular periods, hirsutism (a male pattern of body or facial hair), and hair loss. Often times they are surprised to hear me ask if they have been tested for PCOS as well as Hashimoto’s. A 2013 study found that in a total of 6 studies involving 1605 women, there was an increased prevalence of autoimmune thyroiditis, increased serum TSH, increased anti-TPO antibodies, and anti-Tg antibodies in women with PCOS when compared to control groups. There are many possible underlying causes of melasma and acne. The thyroid is not always the cause. However, if you have these skin conditions, be sure to speak to your doctor about full thyroid testing. If you are not diagnosed with hypothyroidism but you wonder if you have it or if you are diagnosed with hypothyroidism but you still struggle with symptoms, please read the article Top 5 Reasons Doctors Fail To Diagnose Hypothyroidism. Get a copy of your lab results and check that you’ve had all the lab tests included in this article and that your levels are optimal not just normal. There is a big difference. Dogra, A., Dua, A., Singh, P. Thyroid and skin. Indian Journal of Dermatology. 2006;51:96-9. Haritha, S., Sampath, K.K. Skin Manifestations of Hypothyroidism – A Clinical Study. Journal of Dental and Medical Sciences. 2013;4(2):58-60. Talaee, R., Ghafarpasand, I., Masror, H. The Relationship Between Melasma and Disturbances in the Serum Level of Thyroid Hormones and Indices. Open Science. 2015;2(2):19-23. Mogaddam, M.R., Alamdari, M.I., Maleki, N. Ardabili, N. Abedkouhi, S. Evaluation of auotimmune thyroid disease in melasma. J Cosmet Dermatol. 2015 Jun;14(2):167-71. Vergou, T., Mantzou, E., Tseke, P., Moustou, A.E., Katsambas, A., Alevizaki, M., Antoniou, C. Association of thyroid autoimmunity with acne in adult women. J Eur Acad Dermal Venereol. 2012 Apr;26(4):413-6. Artantas, S. Gul, U., Kilic, A., Guler, S. Skin findings in thyroid diseases. Eur J Intern Med. 2009 Mar;20(2):158061. Du D, Li X. The relationship between thyroiditis and polycystic ovary syndrome: a meta-analysis. Int J Clin Exp Med. 2013 Oct 25;6(10):880-9. I am 51 and have had Psoriasis since Junior High. Years ago in my 30’s I was on a very small does of synthroid but was told that after my kids were born I did not need it so I stopped. I have struggled with my weight but other than that I have felt fine until about 2 years ago. Now I have very scaly stuff inside my ears. My thyroid had nodules on it and they were large so they were biopsies and were not cancerous but no doctor has ever asked me about these test…. After 10 years of not feeling well, and my Doctor telling me my TSH was “normal” at 5.2, I sought out another Dr who diagnosed me with Hypothyroism and was put on Synthroid. After 8 years of synthroid, my Dr told me she had patients who had seen great results on Armour Thyroid. So, I switched and didn’t feel any better or worse. However, I did begin to develop melasma. It started slowly, but after 2 years it was extremely bad… I went to dermatologists and had lazer treatments, only to have it come back. After doing research on my own, and reading that it was hormonally related, I blamed it on the fact that I might be perimenapausal at 49. Out of incredible frustration, I decided that if Armour Thyroid was a mix of various hormones, T1, T2, T3, and T4, then quite possibly I might see improvement if I switched back to Synthroid, just T4. My Doctor switched me back and within 2 – 3 weeks my melasma was 75% improved!!! I was ecstatic and can’t believe I didn’t consider this option sooner. So it’s been about 5 weeks at this point and I’m feeling just fine on the Synthroid and my skin continues to improve. Just wanted to share my story. Hoping it might help someone else who is suffering with melasma. Will the melasma disappear when the thyroid is under control? I’ve struggled with this for years. It appeared after the birth of my son 21 years ago! I’ve tried so many clean and organic facial serums. I am on 100 mcg of Tyrosint and I also struggle with losing weight despite going gluten-free, low carb, no soda, no rice or bread and eating healthy….sigh.